Jelastic - Holy grail of Java hosting? I want to write about one weaker part from Java EE world. If you start to learn Java EE, you have to go through many tutorials and learn a lot of information. Finally you can write some simple useful application and want to put it on the internet to others. There is a problem. Where is some hosting for application written in Java? Yes, the weak part, that I mentioned, is hosting. One notice at the begin. Next lines are from beginner's point of view. I dont want to talk about enterprise solutions. Dedicated server - Wholly configuration is in your hands. You have to do all by yourself. If you need only simple hosting for your showcase it's expensive. Amazon Web Services - Again, very complex and later expensive solution. First year is free. But there is a lot of possibilities how to configure it and beginner can be easy lost. Cloud Foundry - Your application is tied with service provider and you need some virtual computer to run VMware image. For me as Mac OS user again little bit expensive. Google Apps Engine - Quite good choice. Easy interface for configuration and deployment. But your source code is tied with provider API. There is quite new service, that have ambition solve this restrictions. Its name is Jelastic. Jelastic is based on well known products which are usually used on dedicated servers. Runtime environment can be Java 6 or 7 and server is probably the most popular java server Tomcat. 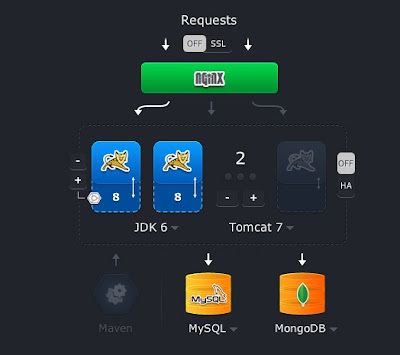 Everyone can choose your relational database (for example MySQL, PostgreSQL) or NoSQL database like MongoDB. For application with high load is there possibility of vertical and horizontal scaling. Everything is setup by this simple form. 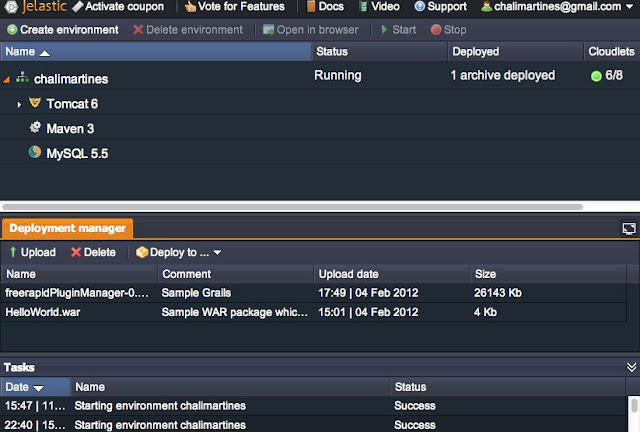 GUI for administration is simple like environment configuration. You can upload WAR applications. Deploy them to Tomcat. Start and stop single services or whole environment. Now I would make some summary. It's in Beta status now, so it's can be unstable. I have really good feeling about Jelastic. I hope that pricing will be friendly and in basic configuration will be completely free. I dont know now about some critical restriction so Jelastic can be recommended for your java web experiments.